With death looming, Jacques Derrida, the world's most famous philosopher, known as the father of "deconstruction," sat down with journalist Jean Birnbaum of the French daily Le Monde. They revisited his life's work and his impending death in a long, surprisingly accessible, and moving final interview. Sometimes called "obscure" and branded "abstruse" by his critics, the Derrida found in this book is open and engaging, reflecting on a long career challenging important tenets of European philosophy from Plato to Marx. The contemporary meaning of Derrida's work is also examined, including a discussion of his many political activities. But, as Derrida says, "To philosophize is to learn to die"; as such, this philosophical discussion turns to the realities of his imminent death--including life with a fatal cancer. In the end, this interview remains a touching final look at a long and distinguished career. "No thinker in the last 100 years had a greater impact than he did on people in more fields and different disciplines.... No thinker has been more deeply misunderstood." 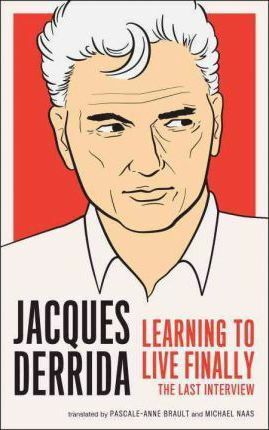 The late Jacques Derrida was Director of Studies at the Ecole des Hautes Etudes en Sciences Sociales and Professor of Humanities at the University of California, Irvine. Among the most recent of his many books translated into English are Eyes of the University, Negotiations, Who's Afraid of Philosophy? and Rogues: Two Essays on Reason.